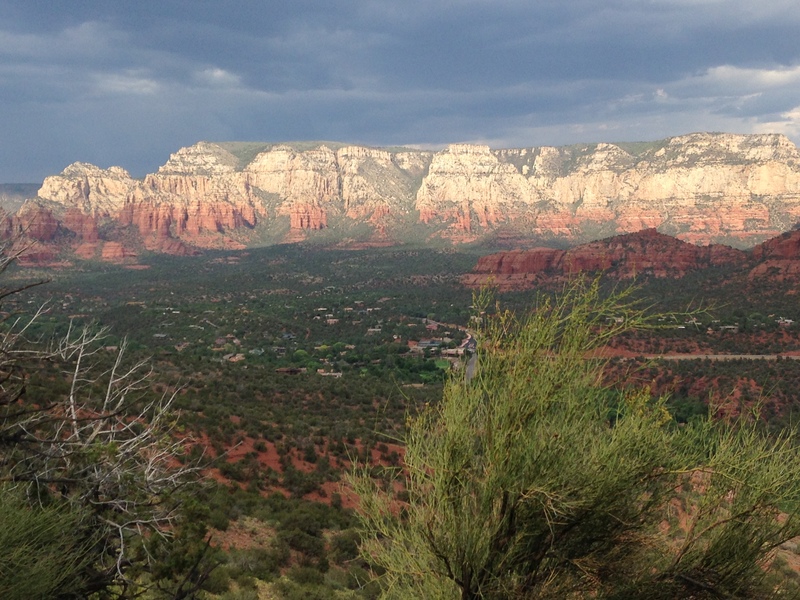 Last week, my daughter and I were hiking a few of the trails around Sedona, Arizona. A local person told us that there were several “vortexes” on those trails, described as areas where concentrated magnetic energy rises from the earth. Apparently, some folks have life-changing experiences on a vortex, while others feel a vibration emanating from the ground. Not surprisingly, some people feel nothing, but many feel a “tingle.” The actual locations of the vortexes are not marked, but we went in search of a tingle anyway. I have read of thin places on the earth, where God has been revealed to someone. The event leaves an imprint that can be felt by others. Thin places are described as areas where the veil between the kingdoms of heaven and earth is more transparent, places where we may feel the presence of God with greater clarity. Places where we know the ground on which we stand is holy. Those places, once we find ourselves in one, command silence and demand our full attention. While I did not feel a tingle emanating from the earth on a hiking trail near Sedona, I have certainly experienced thin places. The centuries-old cathedrals in Europe qualify. The accumulation of weddings, funerals, baptisms, conversions, and worship – the faithful seeking God – leaves a palpable imprint, especially when occurring over centuries. My own church, though young by comparison, also falls into the category of a thin place. The areas in my home where I pray, meditate, write, and ponder spiritual matters is, for me, a thin place. Awe-inspiring landscapes also qualify: the unfathomable depth and breadth of the Grand Canyon, the power of the Pacific Ocean, a stunning sunrise, the red rocks of Sedona. Whether we go in search of a tingle at a vortex, a thin place, or another sort of holy ground, we are not likely to experience anything otherworldly without first being in a state of mind to receive it. Silence. Focused attention. Listening. Seeking. When our minds are mulling our to-do lists, when we are consumed by disappointment with others, when we are shrouded in worry over an uncertain future, we could be sitting in front of a wide-open gate to heaven and never recognize it. I believe it matters less where we seek God and more that we do seek. If God is truly always with us, we should be able to engage with God wherever we are; but we must first be in a receptive mindset. Lives are changed in the presence of, and under the influence of God. Perhaps lives are more easily changed on a vortex; but when a vortex is not accessible, we can find a holy and thin place wherever we are, simply by being willing to allow God to work in our lives. My soul magnifies the Lord, and my spirit rejoices in God my Savior; for he has looked with favor on the lowliness of his servant. Surely, from now on all generations will call me blessed; for the Mighty One has done great things for me, and holy is his name. Tonight I hear a faint and lovely voice drifting through my home, accompanied by a guitar. There is an angel in my daughter’s room, singing. I never would have heard her, had I not been sitting in silence waiting for a blessing. I would like to get closer, but I find such blessings to be finicky – like seeing a doe in the front yard and wanting to get a closer look, but knowing it will run away as I approach. It will run from fear of my intentions, and only the white fluff of its tail disappearing into the woods will be visible before I have the opportunity to explain. I mean it no harm; I only desire to be blessed by its presence. Tonight, I wish to listen to the blessing of the angel without scaring it away. I recognize the shyness of angels, because I, too, was shy when I was young and vulnerable. You see, I needed to sing. Something inside of me regularly struggled for release, and its best exit was through song. But I could only purge effectively in private. The invasion of another into my holy space made the magic of the moment disappear. I could not bear being judged in the process of becoming whole. The moment I caught wind of my mother on the stair, the music stopped. And I know it broke her heart. My soul, magnifies the Lord! The song of this angel is one I wrote, based on The Magnificat – Mary’s song of praise from the gospel of Luke. A Christmas song in July. A song I wrote to bless others, now returns to bless me! I want to sing along, but I fear the music will stop. And my spirit rejoices in God, my Savior, for God looked with favor on me. God raised this lowly servant high…and holy, holy, holy is the name of God! Come home to church this Sunday. Maybe an angel is waiting to bless you there. The number one value mentioned in the Bible, according to research done by Ben MacConnell – no surprise to anyone – is love. The command to love one another is one of the few passages repeated by Jesus in all four of the Gospels. The word love has many meanings in the English language, most of which involve some degree of affection. The Biblical usage of love, however, usually implies caring for the needs of another, and does not commonly imply romance, desire, or even familiarity. For example, in Luke 10, Jesus is discussing the commandment to love our neighbors, and he illustrates that type of love with the parable of the Good Samaritan. In that story, a traveler shows love by caring for a man in need that he does not know. In Luke 6:35, Jesus says, “But love your enemies, do good, and lend, expecting nothing in return.” Clearly, Jesus’ concept of love is more inclusive than the exclusive types of love we read of in fairy tales and romance novels. It is not surprising that love encompasses many other important Christian values. Great acts of love are often also great acts of service. For example, when a soldier dives on a live grenade to prevent the shrapnel from injuring his or her comrades, the soldier has performed a selfless act of both service and love. Other noteworthy acts of love are done for the cause of justice. Martin Luther King, Jr., comes to mind as a person whose tremendous love manifested in his passion for achieving a more just society. Love is the life-blood of our existence. Just as the blood flowing through our veins carries the nutrients required to sustain life, so love nourishes and animates our being. When blood stops flowing, death is imminent. Without the passion and energy provided by love, our lives become mind-numbingly dull. Love is a raging flame that floods cannot drown, according to the passage from the Song of Solomon. Love makes a house a home; love turns business associates into a family; love makes strangers feel welcomed and valued; and love inspires a couple to bind their lives together into one life. Love brings happiness and purpose into our lives, and then spills over to bless others. Some say God is love. I agree. Without love infusing our words and actions, our lives will lack purpose, joy, and meaning. As the apostle Paul writes in 1 Corinthians 13:2, “If I have prophetic powers, and understand all mysteries and all knowledge, and if I have all faith, so as to move mountains, but do not have love, I am nothing.” Love may not be all we need, as the old Beatles song implies, but everything we do and say requires love to attain its highest potential for good. Come home to church this Sunday. Make your discipleship known by showing your love. Alas for you who desire the day of the Lord! Why do you want the day of the Lord? It is darkness, not light; as if someone fled from a lion, and was met by a bear; or went into the house and rested a hand against the wall, and was bitten by a snake. But let justice roll down like waters, and righteousness like an ever-flowing stream. The second most referenced value mentioned in the Bible is justice, according to research done by Ben MacConnell. Dictionary.com defines justice as “the quality of being just; righteousness, equitableness, or moral rightness,” with a secondary definition of “the administering of deserved punishment or reward.” Justice is often symbolized as a blindfolded woman holding a set of scales in one hand and a sword in the other. She is blindfolded to indicate that justice is determined the facts of an issue and not its appearance. The scales designate the unbiased weighing of the evidence from both sides. The sword is for punishment, should a proceeding find the accused guilty. Thus, justice is the product of an objective consideration of the facts, at least in theory. The prophet Amos writes about the justice of the Lord as a day of reckoning, along the lines of the second dictionary definition above. He warns that the Lord’s application of justice will not be pleasant experience for us. Further, he says the justice of the Lord is not something we can escape. The image of fleeing from a lion only to run into a bear is a revealing image. Amos portrays an unavoidable judging of our decisions on earth. There is another aspect of justice expected of Christians, however – social justice, which is assuring that every member of society has access to opportunities for life, liberty, and happiness. For the body of Christ, social justice is a mandate. We are to care for the disadvantaged members of our communities. Several years ago, I visited with a nun who had worked beside Mother Teresa for a time. She and her fellow sisters felt guilty for having cots to sleep on, food to eat, and shelter from the elements, when many they were serving had nothing. Why should those “necessities” not be given to the unfortunate folks they were to help? Mother Teresa explained that disadvantaged people needed to see a better life to reach for, to grow into. The sisters’ purpose was to help the people to an improved and sustainable state for themselves, in ways that could be continued once the sisters were gone. Mother Teresa told them we cannot lift another up unless we are in a higher position relative to them – sinking to their level makes it that much harder to assist. At times we argue over whether justice and mercy require us to give people a “hand up” or a “hand out.” The fact is that justice for folks in need often requires both. Certainly, we are to seek just and sustainable solutions. And we will almost certainly be held accountable for the justice we work towards in this life. You’re gonna have to serve somebody, It may be the devil or it may be the Lord, But you’re gonna have to serve somebody. In his research on Christian values, Ben MacConnell found the characteristic of service referenced in the Bible more often than any others, except for justice and love. In the preface of his book, The Case for Servant Leadership, Kent Keith writes, “There does not have to be so much pain and suffering, so much war and violence, so much starvation and disease, so many crushed dreams and untapped talents, so many problems unsolved and so many opportunities ignored. The world does not have to be like this.” Keith attributes much of what is wrong in the world today to leaders who are more concerned with their own advancement, their own accumulation of wealth and power, and their own legacy, than with providing leadership committed to the service of others. The term Servant Leadership was coined by Robert Greenleaf (www.Greenleaf.org), who believed the world needs leaders whose core motivation is their desire to serve – those who are servants first. Greenleaf’s test of a servant leader is this: “The best test, and difficult to administer, is: do those served grow as persons; do they, while being served, become healthier, wiser, freer, more autonomous, more likely themselves to become servants? And, what is the effect on the least privileged in society; will they benefit, or, at least, will they not be further deprived?” That is a standard not taught in most leadership training. Current day philosopher Bob Dylan sings that we are all going to have to serve somebody. Our world needs unassuming and dedicated servants at every level of every business, church, community, and government. According to the writer of Ephesians, we are to render service with enthusiasm because whatever good we do, we will receive the same from God. If we are going to have to serve someone, we may as well serve God, and we may as well serve cheerfully. Come home to church this Sunday. The road to greatness is a path of service to others.